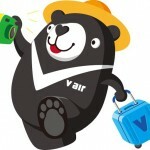 Taiwanese budget airline V Air will launch operations on December 17 with an inaugural flight to Bangkok. The airline, which was established last November, will also launch flights between Taipei and Chiang Mai in northern Thailand from January 7, 2015. Introductory prices for a one-way flight will start at NT$1,988 (US$64). The carrier is likely to face competition from Tigerair Taiwan, a budget airline joint venture between Taiwan’s China Airlines and Singapore’s Tiger Airways, which started operations on September 26 with an inaugural flight to Singapore.